Don’t be put off by the outward appearance of this disc. It looks cheaply produced with its sepia styled photo of Richter. There’s a single side of information that consists of a quote concerning only one of the items plus the producer’s comments on his efforts to clean up these old recordings. What emerges is firstly the truth of the quotation, from America’s Fanfare magazine from March/April, 1990 concerning a previous reissue of this recording of the Tchaikovsky First. There Leslie Gerber commented “I have long remembered this as the great Richter performance of the Tchaikovsky concerto ... while Richter’s playing is magnificent, Mravinsky and the great orchestra second him superbly.” The sound was noted as being “as good as one could hope for ... still limited in fidelity and has some traces of distortion.” The producer Andrew Rose then explains the technical difficulties he had. The results were made possible by using near-mint German reissues from which he has managed to remove most of the distortion. Like an art restorer he has uncovered and revealed a sound superior to anything that had been available on the original releases. He was able to do this even bearing in mind that the earliest recordings here were on 78 rpm shellac discs. These were still being sold alongside the earliest LPs when I first visited Moscow in 1961. 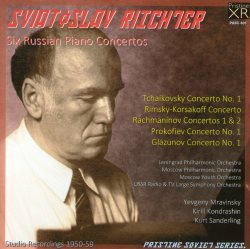 Taking this together with the additional fact that several recordings here are the sole ones by Richter, particularly notable in the case of the Rachmaninov First, and you have a remarkable and highly valuable document of superb music. It’s thrillingly played by one of the true lions of the keyboard. The art of sound restoration is an astonishing one that must give huge pleasure to its practitioners. As a listener I am often overwhelmed by the fantastic job they manage to pull off. I put these discs on after reading what Andrew Rose had to say about his restoration but never expected the result to be as good as it is. I had the same thought when I listened to the recording of the Tchaikovsky that I reviewed back in July 2012 with Van Cliburn and the RCA Symphony Orchestra under Kirill Kondrashin. That was made in the same year, 1958, following his triumph in the inaugural International Tchaikovsky Competition. In that case the sound restorer is not credited; he should be as it is equally impressive. There isn’t much if anything left to be said about the Tchaikovsky concerto. It is always fascinating to read how some works are at first dismissed but later gain a place in the public’s heart. That is certainly the case with this work. Its original dedicatee Nikolai Rubinstein (Anton’s brother) rejected it as ‘worthless’ and ‘unplayable’. This says more about Rubinstein than it could ever have done about the composer who felt mortified at this stinging and unwarranted criticism. Fortunately the great Hans von Bülow came to its defence at the same time calling it ‘so noble, so strong, so interesting in details’ in a letter to Tchaikovsky. He added ‘In short this is a pearl and you deserve the gratitude of all pianists.’ The present recording is a thing of wonder from Richter extracting every last nuance as he turns in a performance that will remain forever one of the benchmark recordings of this totally satisfying concerto. The oldest recording on this two disc set is the Rimsky-Korsakov concerto – one that, I must confess, I’ve never known in detail. It dates from 1950 and as mentioned above was originally released on shellac (Melodiya 017956/9). All the attendant clicks and pops that were inevitable on such records make what we hear now a remarkable tribute to the restorer’s art. In addition it is fairly well documented that in the immediate post-war period the instruments available to orchestras in the Soviet Union were often simply serviceable at best. Nevertheless, this recording is much better than could reasonably be expected. In the performance the Moscow Youth Orchestra plays as well as any. Rachmaninov’s First Piano Concerto, written when the composer was only 18, and later revised, is nowhere near as well known as his second. This may go some way to explain why this is the only Richter recording. He is the perfect vehicle as he was an absolute stickler for detail believing as he said that one should "carry ... out the composer's intentions to the letter". He even went so far as to have a disclaimer printed on discs of his Bach’s ‘Italian Concerto’ after he discovered that in one place he had always been playing an F sharp rather than an F. Taken from the original Melodiya 78 rpm record (25737/44) this is wonderful playing with Rachmaninov’s characteristic romantic sweep faithfully and thrillingly reproduced. Disc two opens with Rachmaninov’s Second Piano Concerto from 1959. He plays the opening notes slower than I’m used to hearing, building the tension superbly, although the orchestra sounds a little too sluggish for me at that point. This soon changes as the music opens out. It develops into a wonderfully exciting performance that justifies the work’s special place in the public’s perception: one of the greatest of all piano concertos. Originally released on a 78 (Melodiya 012670-3) in 1952 Prokofiev’s First Piano Concerto is a world away from Rachmaninov’s second, despite having been written only twelve years later. It sounds a real 20th century composition rather than a nineteenth. It was interesting to discover that Prokofiev won the Anton Rubinstein prize when he performed it at the St. Petersburg Conservatory. The contest was presided over by Glazunov and the prize was awarded to him rather reluctantly. Prokofiev had managed to get twenty copies published so as to qualify for the work to be played at the competition. He had chosen to play it rather than one from the established repertoire reasoning that the jury would be "unable to judge whether he was playing it well or not". It would be fascinating to know what Anton Rubinstein’s brother would have said about it considering his dismissal of Tchaikovsky’s first. After all, it is a powerhouse of a concerto, full of what at the time would have been regarded as ‘modern’ sounds. Released the same year as the above concerto from which the recording is taken is Alexander Glazunov’s Piano Concerto No. 1 (Melodiya 023037 on 78 rpm). It is interesting to note that this was composed at the same time as the Prokofiev work by the 46 year old Director of the St. Petersburg Conservatory. What a different sound-world this comes from in comparison with the 21-year-old’s composition. This may help account for the reluctant awarding of the above-mentioned prize to Prokofiev. The Moscow Youth Orchestra, again under Kirill Kondrashin for both the Prokofiev and the Glazunov, plays wonderfully well while Richter, as always, gives his total commitment to the music. These are utterly arresting performances as with all those on this two disc set. Heinrich Neuhaus described Richter as follows: "His singular ability to grasp the whole and at the same time miss none of the smallest details of a composition suggests a comparison with an eagle who from his great height can see as far as the horizon and yet single out the tiniest detail of the landscape”. Vladimir Horowitz said: "Of the Russian pianists, I like only one, Richter” while the Italian critic Piero Rattalino asserted that the only pianists comparable to Richter in the history of piano performance were Franz Liszt and Ferruccio Busoni. Naturally, he also had his detractors, some saying that his playing could be too dry as violinist Nathan Milstein believed. Van Cliburn, on the other hand said that his playing was the most powerful he’d ever heard. He found himself crying during one of Richter’s performances he heard while in Moscow. Arthur Rubinstein also found tears rolling down his cheeks though he’d initially thought Richter’s playing wasn’t “anything out of the ordinary”. The recordings on this set will also no doubt divide opinion. Given the expert way in which they have been cleaned up to sound better than ever before and the fact that there are unique performances here it would take a flinty iconoclast to deny that these recordings are remarkable documents. Fans of Richter will doubtless wish to add this set to their collection while any who don’t yet know his art would do well to audition these discs to see why the above comments were made. I was truly bowled over by and will be perfectly happy for these to be my only source for these works in future.